Over the past decade, distracted driving deaths in America have dropped from a high of about 6,000 per year to about 3,200 per year. This is an inconvenient truth for the folks who make a living in the auto safety world and automotive media. How can the public be convinced there is an emergency in need of drastic action (and funding increases and legislation changes) if the pesky numbers don't cooperate? We created the chart above from NHTSA's annual Traffic Safety Facts research notes. NHTSA publishes an annual summary of the distracted driving deaths each year after the annual Fatal Motor Vehicle Crashes Overview is published. The most recent overview was published this past October of 2018 and it covers the 2017 calendar year. NHTSA compiles multiple sources to generate these numbers, which are not exact but are also not estimates. The data is compiled from police report and district attorney investigations following fatal automotive-related events. The total number of deaths in all automotive related accidents is exact, and police know from what researchers call "artifacts" what the major causes are. Artifacts are things like the blood alcohol content of the driver of a vehicle involved in a fatality and an open container of alcohol at the scene. Other firm clues as to causes involve such things as the crash results, which give trained accident reconstruction investigators a pretty accurate picture of speeds. Speeding and alcohol are determined to be the major factor in about 60% of the approximately 37,000 deaths related to vehicles every year. The rest of the deaths are broken down into other categories with distracted driving being one of the smallest by percent. Researchers are willing to tell anyone who will listen, and that is a short list, that cell phones (mobile devices, smart devices) account for less than half of overall distracted driving. They know this from observational studies and from witness accounts at fatal event scenes. 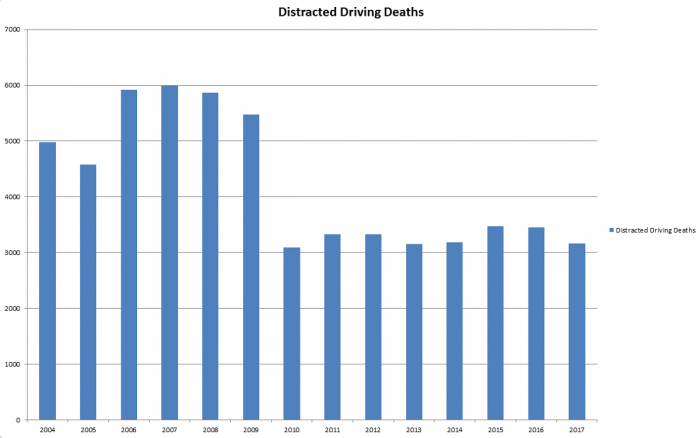 Furthermore, cell phone interaction by drivers is declining, not increasing. Observational studies by both NHTSA and also the folks at the Insurance Institute For Highway Safety and the Highway Loss Data Institute over the past four years have shown that overall, folks are using their phones less, not more. To gain a better understanding of the biger picutre, we reached out to Dr. David Kidd, the co-author of a recent study on distracted driving trends. His team observed that from 2014 to 2018 there was a drop of about 10% of overall cell phone interactions in vehicles by drivers. His study also concluded that drivers talking on cell phones and holding a cell phone had declined. His study did observe that the percentage of drivers seen manipulating a cell phone rose from about 2.3% to 3.4%. That 1.1% bump in one type of driver behavior has now been widely reported as a 57% increase in cell phone manipulation. How? By calculating the percent increase of the percent increase. Dr. Kidd's study concluded that, "...because the behavior is uncommon overall, the increased prevalence would be expected to only slightly increase crash rates." Yet, the headlines this past week have all been predicting dire consequences. Take USA Today for example. Its headline was, "Risky phone use while driving is soaring, and it's killing Americans." What the headline did not say is "killing fewer Americans" which is, in fact, what the NHTSA data shows. Dr. Kidd told Torque News in an interview that his educated view is that more accidents are happening because of cell phones than is being reported in police reports. Dr. Kidd points out that in some crashes that may have involved cell phone-related distraction, there are no easy to find artifacts for investigators to point to. We agree with that opinion, but the problem is the data. We know that police have only become better at determining if cell phones were used, not less skilled at that important task. So, one would assume that police reporting of cell phones as a cause would increase over time. Yet, distracted driving deaths are now half the rate they were before the first iPhone or Android were ever sold in America in mid-2009. If police are underreporting cell phones as a cause of accidents they were most likely doing that in the past as well. Still, speaking to Dr. Kidd has convinced us that changing behaviors should be a focus for more research and remain an important part of the ongoing safety education process for the driving public. Like many who follow this topic, we feel strongly that cell phone usage is a problem in need of management. We also feel that every death is a tragedy and that those deaths should be honored by honest reporting. Top of page chart can be verified by a browser search. Use the key phrase "NHTSA Distracted Driving Deaths" plus the year. Here is the 2013 NHTSA report as an example. Here is the 2009 report. Second chart is a summary of the data in Dr. Kidd's study and is courtesy of IIHS.